Dynamic knowledge databases extend search power across the enterprise. Finding specific information, such as a routing number or current rates, on some credit union websites can be like searching for a needle in a haystack, even when it’s in plain sight. Some sites don’t even have a search box. Those that do, often lack essential functionality. That’s a problem, experts say, because inaccurate or inadequate information on a website can jam other channels, slam the call center, spur complaints and create compliance problems. “As account holders use more banking channels, access to consistent, accurate information has grown in importance for our bank and credit union clients,” said Joe Trafton, senior vice president and chief strategic officer at Avon, Conn.-based core processor COCC, which recently partnered with SilverCloud Inc., a Portsmouth, N.H.-based software developer and SaaS firm, to help credit unions harness the power of shared knowledge to improve communication. Dynamic knowledge databases, such as SilverCloud’s latest offering, Tempest, can help organizations maintain clarity, accuracy and transparency across all channels, and to comply with emerging CFPB requirements and initiatives, said Scott Cornell, CEO at SilverCloud. “The CFPB wants FIs to track and analyze issues – and to then be proactive,” Cornell said. Tempest, an enhancement of SilverCloud’s Breeze platform, can be embedded in websites to replace traditional search boxes, and integrated into social media and mobile banking channels, Cornell said. Tempest, which features customizable templates that cover 20 different topics and the most popular inquiries from CFPB databases, also captures, centralizes, manages and analyzes complaints, the company said. Users pose questions in a natural and intuitive manner. The platform also integrates products such as loan applications. Meanwhile, Portal provider Passageways of West Lafayette, Ind., has enabled more than 300 credit unions and other organizations to provide instantaneous answers to thousands of users. By implementing dynamic FAQs and other enterprise collaboration systems, credit unions can experience significant gains in member service, operational efficiency and revenue, said Paroon Chadha, co-founder and CEO of Passageways. 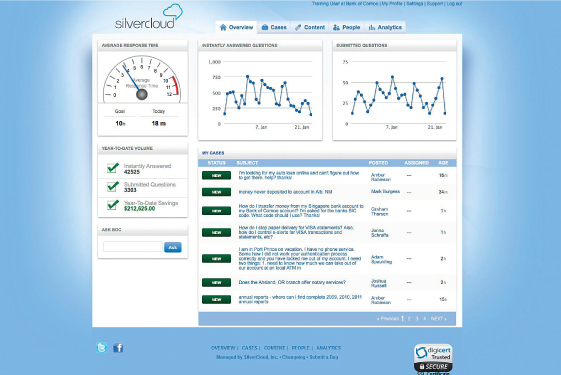 In August, the NCUA’s Office of Small Credit Union Initiatives introduced FAQ+, a search engine powered by SilverCloud. High call center volume also prompted Smart Financial Credit Union in Houston to partner with SilverCloud in 2009, said Michael Warrell, who was senior vice president of member services at the $334 million Smart Financial when it launched Breeze. Warrell, who is currently chief operations officer at the $318 million Community Resource Credit Union in Baytown, Texas, said, “We’re in the process of budgeting for SilverCloud and doing due diligence, with the goal of rolling it out in the second quarter of 2014,” he said. At Smart Financial, he said, the platform significantly reduced call center volume. “We were averaging 100,000 calls per year, but we were able to reduce call volume by 20 to 25% by improving the way members could search our website,” Warrell said. To encourage members to use the new dynamic search engine, Smart Financial launched a direct mail and email marketing campaign that targeted members who frequently contacted the call center. Another benefit, he said, is that credit unions only have to make changes in one area in order to make updates in real time on all channels.